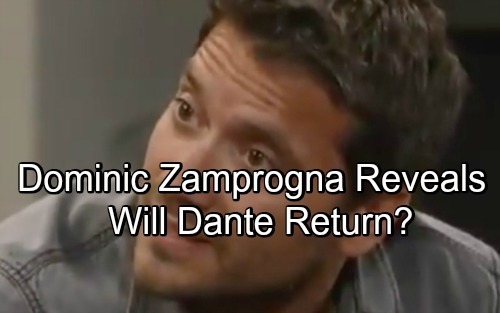 General Hospital (GH) spoilers reveal that fans are already missing Dominic Zamprogna as Dante Falconeri. His exit was a tough blow for both the show and loyal viewers. In an interview with Michael Fairman, Zamprogna opened up about his decision to leave the role he held for nine years. It wasn’t an easy choice, but it’s the one Zamprogna felt he had to make. Of course, lack of story was a clear factor. Fans were always begging GH to give Zamprogna some juicy material. Halfway through his second contract, Zamprogna and Emme Rylan (Lulu Falconeri) were approached about being sidelined. “Getting them back in the game” led to the Dante and Valerie (Brytni Sarpy) cheating storyline. That provided some fantastic drama, but it quickly fizzled. From then on, Zamprogna wasn’t given anything very exciting. Dante mainly just did detective work and sappy relationship scenes. He was rarely the driving force of any storyline, so that was a real problem. Zamprogna admitted he wasn’t truly happy at GH anymore. He ended up bringing that negative energy home with him, which wasn’t the ideal situation for his family. Zamprogna also went on social media often and saw that viewers had similar frustrations. Most people wanted Dante front and center, but General Hospital made it clear that wasn’t happening. Zamprogna began to crave roles outside his comfort zone, but his contract kept him tied to GH for a while. He was voted “Most Underutilized Actor of 2017,” so this stuck talent was desperate to spread his wings. Zamprogna was anxious to break out of this situation and try something new. Dante was created by Bob Guza, GH’s former head writer. He was known for writing more mob stories and often listening to actor input. Zamprogna admitted that Guza may have spoiled him a bit. Fans out there had their fair share of issues with Guza’s work, but Zamprogna got solid treatment under his pen. He couldn’t complain about the great writing he received, especially when things went downhill later. Zamprogna is missing the cast and crew, but he still keeps in touch with everyone he got close to. Maurice Benard (Sonny Corinthos) and Emme Rylan became especially good friends, so Zamprogna definitely isn’t letting them go! Still, Zamprogna insisted that he made the right call. He was ready to depart, so GH had no way to change his mind in the end. For now, GH fans will just have to wait along with poor Lulu. General Hospital spoilers say she’ll be in romantic limbo for now, so that’s a bummer for Rylan. We’ll give you updates as other news comes in. Stick with the ABC soap and don’t forget to check CDL often for the latest General Hospital spoilers, updates and news.